On Thanksgiving Day, BAIT made a donation of $15,628 to A Place Called Home – a donation made possible by all the customers who purchased the BAIT x Saucony “CruelWorld” collaboration. As a thank you, BAIT is offering the chance for those same customers to take part in another good cause. Everyone who registered for and purchased the “CruelWorld” Shadow Original online will receive a private link to purchase a special BAIT x Asics Gel Lyte III “Basics Model-001 Vanquish” Philippines Relief Charity Bundle. Continue reading for details on the exclusive offer. $40 of each bundle purchase will be donated to the Philippines relief effort to assist in the recovery from super typhoon Yolanda/Haiyan. 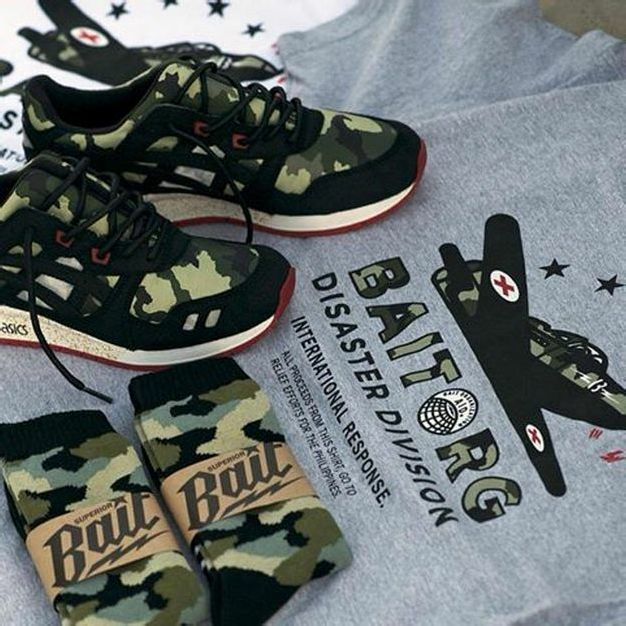 The BAIT “Vanquish” camo socks will also be available at BAIT stores for $10. All $10 will go towards the Philippines relief effort.